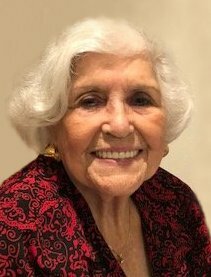 Obituary for Elvia (Guevara) Percival | McCombs Funeral Home Inc.
Elvia Percival, 88, of Cape Girardeau, died Sunday, February 10, 2019, at Southeast Hospital in Cape Girardeau. She was born November 26, 1930, in Dallas, Texas, to Louis and Pearl Ealo Guevara. She and Dean Percival were married August 25, 1973 in Dallas. Elvia and Dean lived most of their married lives in Cape Girardeau. Elvia worked in various local insurance businesses, most recently at Crawford & Co., retiring in 2003. Together, they enjoyed attending Cape County Cowboy Church near Oak Ridge, playing golf at Kimbeland Country Club in Jackson, and socializing with many friends made years ago at ballroom dance classes. Elvia’s memberships included Order of Eastern Star Cape LaCroix Chapter, the Cape Homemakers Club, and she was a volunteer English teacher at the former Cape Girardeau Vo-Tech School. She liked to play Bridge but enjoyed the group more than the game, and in recent years she especially enjoyed water aerobics at Fitness Plus in Cape Girardeau. Loving survivors include her husband of 45 years, Dean Percival of Cape Girardeau; three children, Louis (Lynda) Martinez of Ovilla, Texas, Vivian Marquez of Garland, Texas, and Lilia Charters of Cape Girardeau; a brother, Louis (Gloria) Guevara of Mesquite, Texas; five grandchildren, Tony Martinez of Dallas, Taylor Martinez of Richardson, Texas, Stephanie (Cooper) Lumsden of Houston, Texas, Matthew (Stephanie) Marquez of McKinney, TX, and Malachi Charters of Dallas; two great- grandchildren; and five-step-children. She was preceded in death by her parents and a stepson. A memorial visitation will be held from 9 a.m. to service time, Thursday, February 14, 2019, at McCombs Funeral Home in Cape Girardeau. A memorial service will be held at 10:30 a.m., Thursday, February 14, 2019, at the funeral home, with the Rev. Jim Matthews officiating. Memorials may take the form of contributions to the American Heart Association.